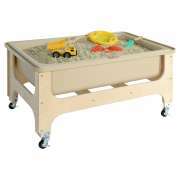 A sand and water table from Hertz Furniture will become a fast favorite in your preschool or daycare. This engaging preschool furniture enables young learners to explore the world around them through different mediums. How do you know what kind of sensory table to get? 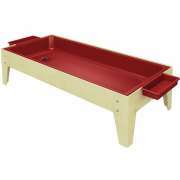 Choose from our great selection of sand tables and water tables. Little ones will just love coming in to school to find out what new material you have filled your sensory table with. Sand and water tables offer unlimited possibilities for classroom fun and hands-on educational activities. 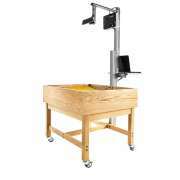 Why should I get a sand and water table? Sensory tables help children build important skills as they play. Handling different mediums with hands and tools facilitates development of pre-writing skills and hand-eye coordination. As little ones practice pouring and measuring, they develop critical fine-motor skills. Sand and water tables are also designed so that many children can play together which encourages cooperative learning and teamwork. What style sensory table is right for me? 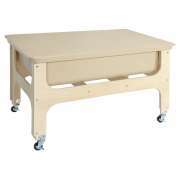 You can choose between plastic and metal water tables for kids or wooden tables with a plastic tub insert. Plastic is a more budget-friendly option, while wood has a natural look that will coordinate well with other preschool furniture. Sand and water tables from Wood Designs are constructed from natural wood with a healthy eco-friendly finish. Their corners are rounded to prevent injury. 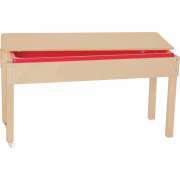 We also offer great models from Children&apos;s Factory and Childbrite. Great sensory tables make the perfect preschool learning center. You can designate a corner of the classroom for exploring different materials, so children will come in each day with a renewed sense of curiosity. You can fill your table with water, sand, rice, beads, cereal, soil and just about anything else you can think of. You can also vary the tools you provide to manipulate and explore the medium in the tub. 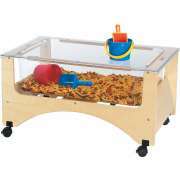 What are the advantages of a clear sensory table? See-through sensory tables offer a unique opportunity for observation. They enable young learners to view the properties of various materials from all directions. This will engage students who are actively manipulating various mediums as well as other children who may be watching nearby or looking on from a distance. Another excellent option is a kids water table that is divided down the middle so you can put a different material on each side. Where can I get a portable water play table? 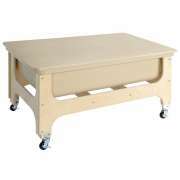 If you have a smaller learning space or you want more flexibility, casters are a convenient option. 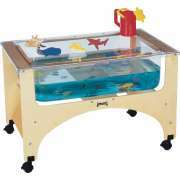 We have a number of water play tables on wheels which can be transported between classrooms or for special events. With this arrangement, you can save money by sharing sand and water tables between classrooms rather than ordering a separate one for each room. It also enables you to take sand water tables outside on a nice day for an extra outdoor activity. 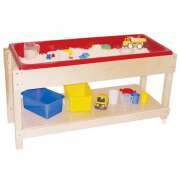 Additionally, if space in a particular classroom is limited and you want to work on sensory skills at certain times, you can wheel the sand and water table in and out as needed. 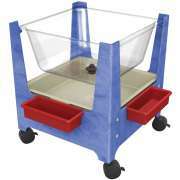 Should I get a sand and water table with a lid? Many of our sensory tables come with lids. This is a helpful feature because it prevents stray objects and dirt from mixing in with what you have in the table. 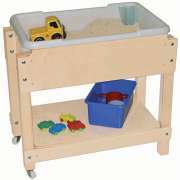 It is also a space-saving option because, when you put a lid on your sand and water table, you can use that surface like a regular preschool activity table. 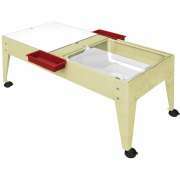 This gives you an extra work surface that is readily-available whenever you need it. We have a selection of sizes for little ones and older students. Both junior size and large tables are available. 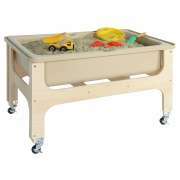 Junior size tables let you enjoy the benefits of a sand and water table, even if you are limited on classroom space. Large water tables for kids are great for group activities. 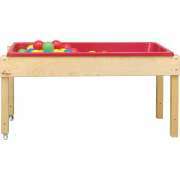 Toddler-size tables are just right for your youngest charges, so they can start developing their skills even from a very young age. Hertz Furniture&apos;s wide selection of educational and fun sensory tables offers great choices for your preschool, daycare or kindergarten. 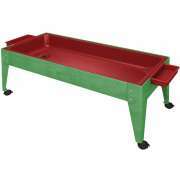 No matter how large your classroom is and how many students you have, you can find a great sand water table that fulfills your needs. If you need help choosing from all of the wonderful options, contact the Hertz Design Center.